An excellent variety, Astrantia major ‘Buckland’, with its soft green to pink flowers is an easy care shade loving plant. Flowering in late summer to winter, the flowers are held well above the foliage on tall stems. It will grow well in any good soil as long as it has protection from the heat of the sun. The flowers are on long stems and they re suited for use as cut flowers. This is a long flowering variety and will flower freely over 2 months from summer on. Plant Astrantia major ‘Buckland’ in a humus rich soil in part shade. Water well after planting out and use a liquid seaweed fertiliser to promote strong root growth. Over time the plant will form a clump and you can divide larger clumps in early spring. As the flowers fade you may choose to deadhead them to prevent the plant from self seeding. Deadheading will also encourage a second flush of flowers. 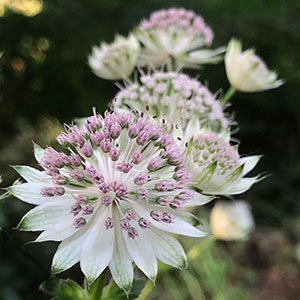 It is best to deadhead this variety, as Astrantia will not always come true from seed. Common Name – Astrantia ‘Buckland’, Pink Masterwort. Spread – Clump forming over time. Flowers – Very pale pink to green with a silvery centre. Flowering time – Summer onwards. Propagation – Division of established clumps.